Peter Cushing plays the great Sherlock Holmes absolutely brilliantly. In fact, it is rather unfathomable to think that anyone else could play Sherlock Holmes after his performance. Sherlock is now trying to save Sir Henry (Chris Lee) from the Henry curse of the Hound of the Baskervilles. It is incredibly refreshing to see Chris Lee as the good guy in this Hammer Films as it really showcases his acting talent (he plays a vulnerable victim as well as he plays Count Dracula). I have long said that this Sherlock Holmes tale is Hammer Films finest hour. The atmosphere is absolutely mesmerizing. Never in a Hammer Film has such an atmosphere been matched. The costumes were wonderful and they aid in drawing you into the movie. Not to mention, the story had no slow parts (as is usually typical in Hammer movies). While the movie wasn’t particularly frightening, what Hammer film is? Hammer Films tried to build the reputation of “soap opera-ish horror” and leaned toward the “romanticism” of terror than the actual “fright”. This film epitomizes this more so than any of their other films. In fact, so much so that it still truly shocks me that this film bombed horribly when it came out. However, this film has gained its respect in the video market and I often see it in horror books, websites, etc. 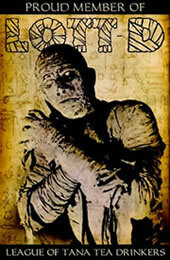 as one of the top 100 horror films of all time. 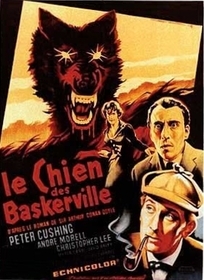 The DVD is a very worthwhile purchase for all Chris Lee fans as there is a Hound of the Baskervilles featurette where he talks in great length of his friendship with Peter Cushing (and, yes, I mean, GREAT LENGTH. It is very well documented that Chris Lee loves to hear himself talk). Not to mention, there is another feature where you can hear Chris Lee read excerpts from the book Hound of the Baskervilles. Not bad, for a fairly inexpensive DVD. If you are visiting this site, this isn’t a “must see”, this is a “ya should’ve seen it by now” movie. If you fouled up and haven’t, leave the computer immediately and go rent it. Better yet, go buy it. This movie has it all. Horror. Romance. Dialogue. Atmosphere. And not to mention, a very youthful Chris Lee who is bearing a rather nicely rounded behind. What more could you possibly want? Submitted by Doug Buseck (not verified) on Mon, 2010-03-29 22:34. Indeed, this is a greatly underrated film. Submitted by G (not verified) on Fri, 2011-01-28 14:34. Peter Cushing in the role he was made for...Holmes portrayed as the books indicate...namely a first class nut. Detatched, cold, non-regulated, dogged and living entirely in his own clear view of the world around him. Rude sometimes but still heroic. You didn't mention Andre Morrell as Watson, here not a goofball but a conventional Victorian gentleman who comes off as a laid-back sort when his roomie's fireball computations start launching. One of the greatest films about The Master, even if they changed the resolution...and villians.